In an attempt to sully the attempts of email hackers Yahoo on Tuesday finally rolled out two-step authentication for better password control. Under the company’s new methodology if a device is not recognized as a typical login option the platform asks users to answer a security question before they can continue. If users would prefer they can also choose to have a code sent to their mobile phone via text message. Under the company’s new two-step authentication a mobile number is mandatory if a user wants to use the service and their mobile number must be confirmed via a code sent by Yahoo in SMS format. 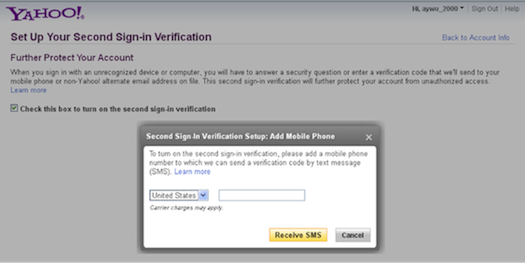 Will you be implementing the new Yahoo two-step authentication process?